Digital Circuit is the "evilest" second level of Shadow the Hedgehog for the PlayStation 2 and GameCube, arrived at if you complete the Dark mission in Westopolis. This level is not a location as such, but rather an abstraction of the United Federation's computer mainframe; essentially, Shadow and Rouge are running around inside the Internets. Techno neon colours and breakneck wire-surfing are thus the order of the day, along with physical password walls and enemy antivirus programmes. After acquiescing to Black Doom's orders and defeating the GUN forces in Westopolis, Shadow is dispatched by the alien overlord on a mission to cripple the humans' communication infrastructure, intending to plunge the world into chaos. To this end, Shadow is Chaos Controlled into electronic form inside the UF mainframe. Doom's Eye instructs him to delete the core programme controlling information flow, but as Shadow progresses into the binary realm, he's given a different choice by none other than Rouge the Bat. How the thief got in there too is anyone's guess, but she's on a mission to collect the Chaos Emerald that's powering the system, and asks Shadow to help. It's GUN vs. Black Arms crossfire that Shadow has to avoid again in this level, although actual human GUN soldiers are conspicuous in their absence; instead the fight against the aliens is being prosecuted by GUN's robotic Beetle drones, and the crystalline antivirus programmes which divide twice before they are destroyed. 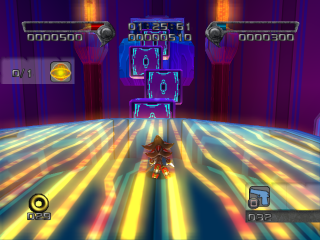 The level is very similar to a later journey Shadow takes into Eggman's mainframe: Mad Matrix. The door is located to the left of the fourth checkpoint. Behind the door is a warp portal that takes you to a platform near the next light speed section. It lets you enter another section of it with some rings and items.